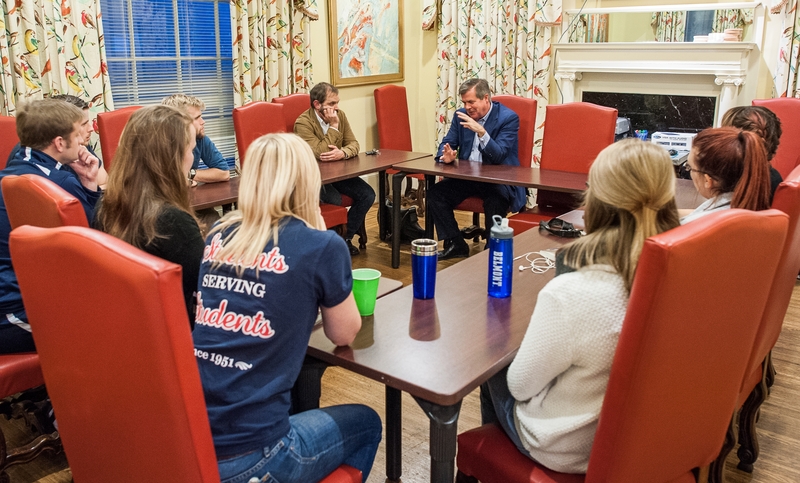 Former Nashville Mayor and current Belmont Distinguished Visiting Professor of History and Politics Karl Dean joined an Honors 3400 course—“Leadership and Advocacy”—and spent nearly 90 minutes interacting with students and faculty member Micah Weedman. In addition to answering student questions (“what was the best thing about being Mayor?”), Dean talked about the relationship between leadership and social, cultural and political change, recalling stories of his own time in office. He recounted the evolution in the City’s position on LGBT rights, the fight for AMP and increased mass transit, and defeating the “English only” ordinance by building a coalition of partners across the city. He shared his optimism for Nashville’s future and encouraged each student to consider a career in leadership and politics.